Talisman was created in 1980 to provide museum quality cleaning and restoration services for Oriental carpets and area rugs. Although Talisman is based in the San Francisco Bay Area, we are well known to collectors, auction houses, and museums throughout the United States and abroad. 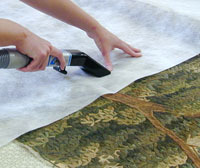 The primary reason for our success is that, in seeking ideal approaches for cleaning area rugs, Talisman has broken entirely with the superficial and potentially harmful practices of wall-to-wall carpet cleaning and machine washing – choosing instead to found its methods on the principles of museum conservation science. 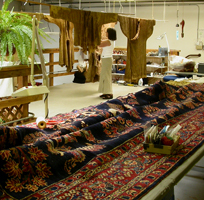 Today Talisman's expertise extends beyond rare and important rugs to area rugs of all types. Experience gained in cleaning and restoring antique rugs is also brought to cleaning contemporary area rugs - while prices remain low and competitive. Even the humblest of floor coverings must be cleaned with care and attention. For a reference, you may speak to any of our designer clients such as Michael Smith, Inc., Ann Getty and Associates, Joan Weisman Design Studio - to any Oriental dealer, especially higher end dealers such as Emmett Eiland Oriental Rug Company, Claremont Rug Company or Floor Designs - or to any collector of rugs, tapestries or textiles that you might find through the various ethnographic textile, tribal art or Oriental rug shows, conferences or periodicals - or to any Oriental rug society such as the Hajji Baba club or the San Francisco Bay Area Rug Society. Talisman's focus is primarily on area rugs belonging to homeowners in the private sector, however our services are also available to public institutions. 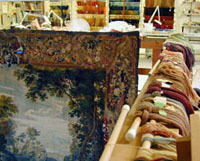 The large collection of Oriental rugs in the art collection of the Banc of America world headquarters were under Talisman's care for many years, until the offices moved out of state. Montgomery Securities' noted collection of antique rugs - covering three floors of the TransAmerica Building were cleaned and conserved by Talisman for nearly two decades, until the company's eventual restructuring. Talisman cleaned for the Fine Arts Museums of San Francisco several early Turkmen rugs in the Wiedersperg Collection – these services are acknowledged in the Museum's publication "Between the Black Desert and the Red: Turkmen Carpets from the Wiedersperg Collection." A large tent hanging from Mali was cleaned for the opening of the new redesigned and reconstructed De Young Museum – and is currently exhibited at the entrance to the textile rooms. A group of 18th Century Chinese carpets has been cleaned for the Asian Art Museum of San Francisco. The Getty Museum deaccessioned its Oriental rug collection in 1990, but the museum has contracted with Talisman to clean and prepare for display two panels of a rare Shah Sevan Kilim. Talisman has also provided services to "house museums" administered by the National Trust for Historic Preservation, Washington, D.C. Museums on the East Coast, such as the Metropolitan Museum of Art in New York, refer clients to Talisman. Our work on the textiles in Lloyd Cotsen's Neutrogena Collection are now primarily displayed in their own wing of Santa Fe's Folk Art Museum. Talisman's work has been acknowledged in the recent book "Five Centuries of Indonesian Textiles" (the author is a former curator of textiles at the L.A. County Museum of Art). In 2005, Talisman completed the extensive conservation of a large group of 13th C. Yuan dynasty silk court robes – including an exceptionally rare Guguguan crown. Subsequently, members of our staff attended the exhibition of these textiles at the National Silk Museum, Hangzhou, China. Talisman has given presentations at the 1990 International Conference on Oriental Rugs in San Francisco, the 1995 meeting of the American Institute for Conservation in Minneapolis and the 1996 and 2000 meetings of the American Conference on Oriental Rugs in Santa Monica and San Francisco respectively. We are also honored to receive referrals from the heads of the Oriental carpet departments of Sotheby's and Christie's auction houses - and from dealers throughout the United States who specialize in Oriental rugs, area rugs and tapestries. Please free to contact any such resource for a reference. HALI, published in London - the respected international journal for collectors and scholars of Oriental carpets - has written that Talisman provides "the finest quality conservation services outside the museum environment." For further information on any aspect of rug cleaning or repair - including, not only antique rugs, but also modern area rugs - please contact me personally. San Francisco Bay Area Oriental rug cleaning, Marin, rug cleaning in Mill Valley, Sausalito, rug cleaning in Ross, San Rafael, rug cleaning in El Cerrito, Berkeley Oriental rug cleaning, Kensington, Oakland Oriental rug cleaning, Montclair, Piedmont, rug cleaning in Ross, Hillsborough, rug cleaning in San Mateo, Saratoga, rug cleaning in Palo Alto, Portola Valley, rug cleaning in Menlo Park, Woodside, rug cleaning in Moraga, Atherton, rug cleaning in Walnut Creek, Los Altos, rug cleaning in Alameda, San Jose Oriental rug cleaning, rug cleaning in Monte Sereno, Los Gatos, rug cleaning in San Rafael, Santa Cruz Oriental rug cleaning, Monterey/Carmel rug cleaning.